How Far is Ace Casablanca? 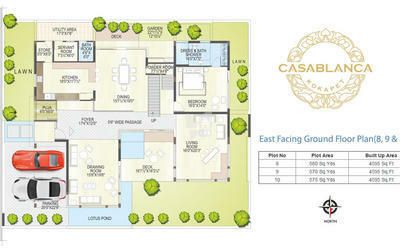 Casablanca is a premium gated community of luxury villas Located in HYDERABAD'S Kokapet . Red brick or Fly ash cement brick masonry in cement mortar, Walls of 9" thick outer & 4" inner walls. Internal: Double coat cement plastering of 213 mm thick finished with luppum. External: Double coat cement plastering of 18 mm thickness. Smain door: Best Teak wood frame & shutter aesthetically designed with melamine matt polish fixed with door eye view and reputed make hardware. Internal doors: Best Teak wood frame and flush shutter with veneer finished with melamine matt polish fixed with reputed make hardware. Internal: Two coats of acrylic emulsion paint over a base coat of primer. External: Premium quality texture painting. 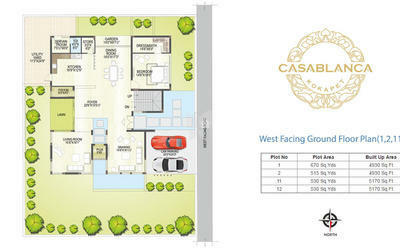 - Bedrooms: 2'x2' Vitrified tiles of premium quality and reputed make, Wooden Flooring (Optional). - Dining and drawing rooms: Italian marble. - Kitchen: Anti-skid tiles of premium quality. - Toilets: Best quality acid-resistant and anti-skid ceramic tiles. HANDLES & LOCKS: YALE / Dorset or similar. Kohler /American Standard Sanitary Ware or similar Kholer / Hansgrohe, faucets or similar. CPVC Pipes for Water & PVC for Sanitary. Kitchen:Vitrified glazed ceramic tiles dado up to 2' height above the kitchen platform. Toilets: Designer glazed ceramic tiles dadoing up to 7' height. Utility / Wash: Glazed ceramic tiles dado up to 3' height. DG back up with acoustic enclosure for common areas and clubhouse. 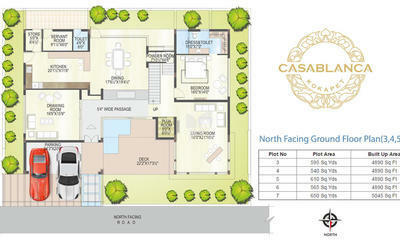 Club house with Gym, swimming pool and Party Area.